One of the things I always like to do when I can, is save special bottles that are given to me and open them with the givers. 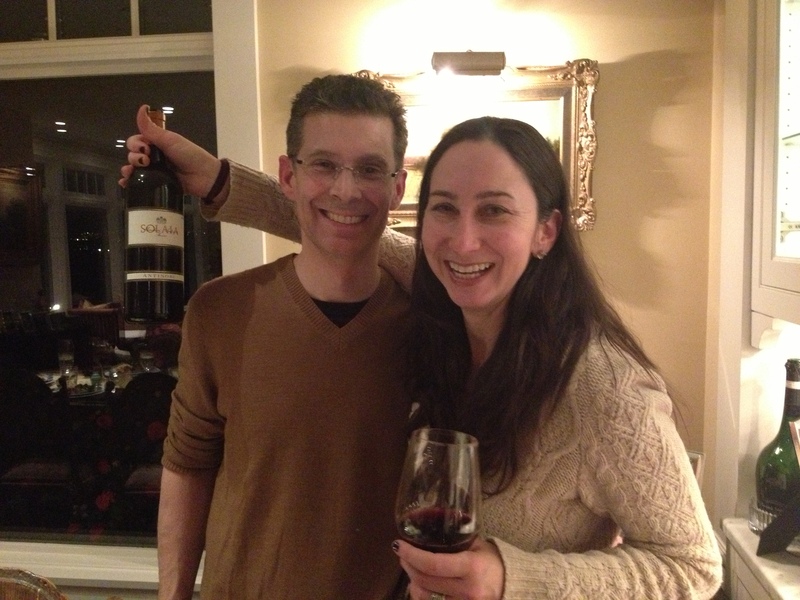 I had been saving a bottle of the 1998 Solaia to drink with our dear friends Heidi and Angel Diaz, who gave me the bottle for my birthday several years ago. Recently, we got to re-gift it to them. (It’s the best kind of re-gifting!) 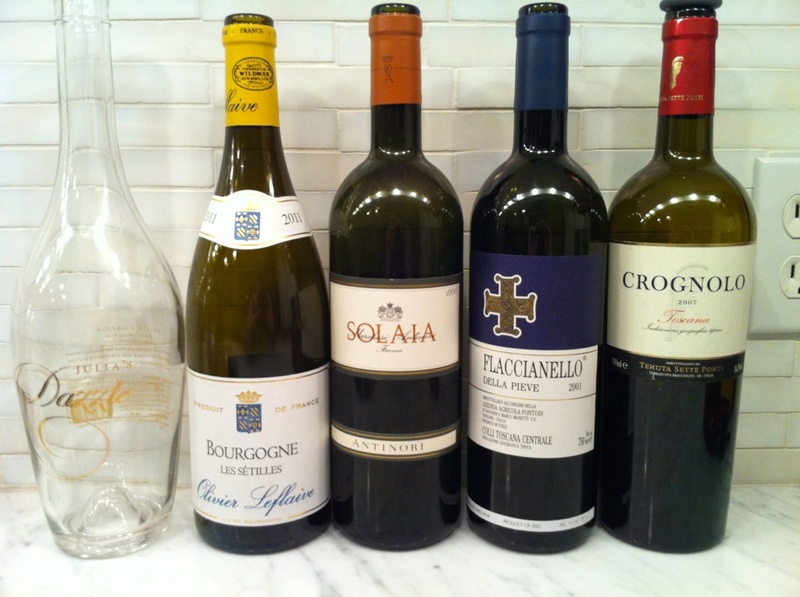 Of course, the Solaia wasn’t the only wine we tasted that night. Bob Watt and Heidi Diaz with the re-gifted Solaia. The main course for dinner that evening was Italian inspired and something of my own creation. It has been named by some friends of ours “Bacon on Bacon”. It is essentially a prosciutto wrapped pork tenderloin and is fairly simple to make (see recipe below!). With Italy being the main theme, we started the evening off with white burgundy, then a dry rose, followed by the Solaia, a Flaccinello and a Crongnolo. Finely chop a bunch of sage and rosemary. Add several heaping tablespoons of country mustard (with the seeds), and mix in the sage and rosemary. Add a fair amount (several tablespoons) of olive oil to make the mustard and herbs not so dry and pasty. Then salt and pepper the tenderloin to taste on one side and spread the mustard/herb mixture over the tenderloin. Spread capers and pine nuts over the tenderloin as well. Now cover the top of the tenderloin with two pieces of prosciutto and spray it with olive oil. You will want to spray the bottom of the dish you are working in as well, otherwise the prosciutto will stick to it. Turn the tenderloin over and repeat the process. Heat a large oven-proof frying pan and sear the prosciutto and tenderloin on all sides (approx. 2 minutes per side). Once the searing is done, put the tenderloin in the oven and bake for 30 minutes at 400 degrees. After 30 minutes, pull the tenderloin out of the oven and remove from the pan to rest for 10 minutes. The tenderloin will continue to cook from the internal heat. While the tenderloin is resting, add some cheap Madeira to the pan (Full and Rich if they have it, but Rainwater will do), approximately 1 cup. Use the Madeira to deglaze the pan you cooked the tenderloin in, so you are scraping all of the little brown bits off of the bottom. Add one piece of torn up prosciutto to the pan as well. Reduce down the Madeira so you end up with only 1/4 of the liquid, approximately 10 minutes. Cut up your tenderloin, put it on the plates and then spoon some of the Madeira sauce over the tenderloin and serve. I prefer to use Madeira over red wine; because it has a much higher acidity that works well with the oil/salt content of the prosciutto.